Ever see an old "tube" computer monitor or TV with rainbow-like color issues around the edges? It's a problem caused by magnetic interference, easily solved by degaussing the monitor. To degauss something means to remove, or at least drastically reduce, a magnetic field. Magnetic interference was so common with CRT displays that degaussing coils were built into these types of screens to occasionally remove this interference. 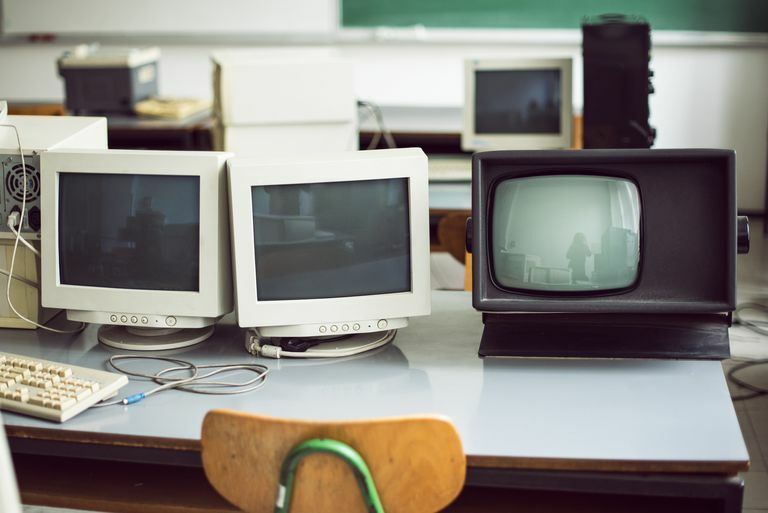 Most people no longer have those old "tube" monitors and so this isn't a common task these days. The large, high resolution, inexpensive flat LCD screens of today work completely differently, do not suffer from magnetic interference, and so never require degaussing. There are lots of reasons why a computer screen might have some kind of color problem, but if you have an old CRT-style monitor, especially if the discoloration is mostly near the edges, degaussing will probably fix it and should be your first troubleshooting step. Power off, and then power back on, your monitor. Most CRT monitors will degauss automatically when turned on, so try this first. Degaussing makes a sometimes loud twang sound and is often followed by a short click sound. You may even be able to "feel" it if your hand is on the monitor. If you don't hear these sounds, the monitor probably does not automatically degauss when powered on. If the discoloration does not improve, continue to the next step. Locate the degauss button on the front of the monitor and push it. In the rare case the monitor does not automatically degauss, you can try this manual step instead. Tip: The degauss button will most likely be accompanied by a picture similar to a horseshoe, representing that classic "horseshoe magnet" shape. Some degauss buttons actually are a horseshoe icon (versus a standard, round button). Press the brightness and contrast buttons at the same time. Some monitor makers decided to forego the dedicated button for this simultaneous button press method instead. Still no luck? Some monitors hide the feature even deeper. Sometimes, especially with the "newest" CRT monitors (we know, funny to use those words together), the degauss option will be buried inside the on-screen menu options. Scroll through these options and locate the degauss option, which you'll select with whatever selection button you've been using to "enter" other commands/options in the monitor's on-screen menu. Tip: If you have trouble finding the degauss option, consult the monitor's manual for more information. See How to Find Tech Support Information if you can't find your manual and you're not sure where to go next. The best way to prevent the magnetic field disturbances that caused this discoloration on the monitor you just fixed, check around the screen for sources of magnetism. Usually, this is something like unshielded speakers, power sources, and other major electronics. Yes, of course, magnets cause this as well! Leave those for the refrigerator or the science project in the other room. As much of a problem as degaussing sounds like with monitors and televisions, it may be something you actually want to do if you have data on a hard drive that you want to erase forever. Handheld degaussing wands and desktop degausser machines apply a super-strong magnetic field to a hard drive, destroying any data stored on it. Actually, wiping a drive is cheaper and equally effective, but degaussing is another option on a very short list of completely effective ways of erasing a hard drive. The word degauss comes from the word gauss, which is the measurement of a magnetic field, named after famed physicist and mathematician Johann Carl Friedrich Gauss who lived in Germany in the late 18th and early 19th centuries.